Yesterday afternoon, I had lunch with Gary Hart. One of the things that ended up as conversation fodder was image processing. While Gary and I vary greatly in regard to actual workflow, we share the same basic philosophy that the image should be created in the camera, not on the computer. While Photoshop, Lightroom or whatever product you use, is certainly an essential component in the process, it’s my feeling that the software shouldn’t be where the creativity comes from. I took this image several years ago using a Canon RebelXT that I’d converted for infrared use. I’d always liked this shot but it had a giant airplane vapor trail through much of the area to the left of the church steeple. After several failed attempts at removing it, I relegated the image to the archives where it’s been until yesterday. The conversation, with Gary, reminded me that there was a new tool in Photoshop CS5 that I hadn’t tried yet: content aware fill (CAF). Unlike the healing brush or clone tools, content aware fill looks at the pixels in the area and makes an intelligent effort to match the surrounding image. I clicked on the selection tool and drew an ellipse around the jet trail. I right clicked on the selection, picked “Fill,” “Content Aware” and the jet trail magically disappeared. Even though all of my cloning efforts left noticeable traces, CAF removed the trail and perfectly blended the change. Software didn’t create this image but it certainly saved the day. 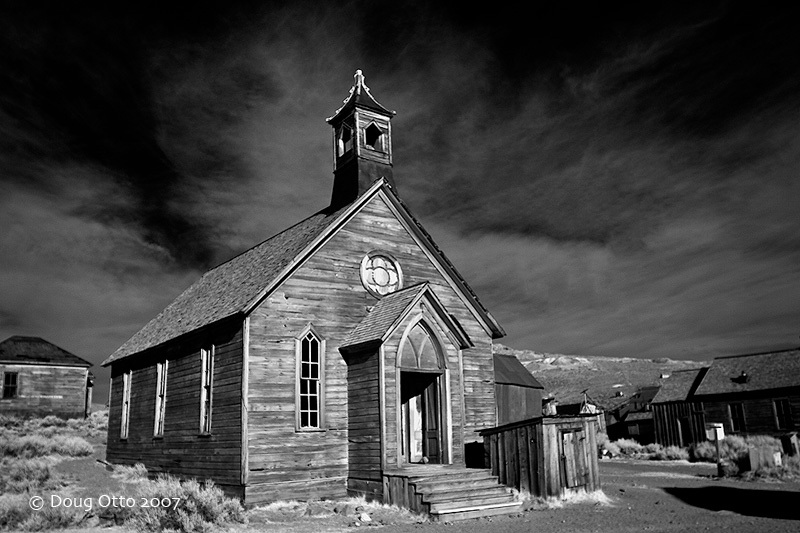 This entry was posted in Photography and tagged black and white, Bodie, Canon, doug otto, infra-red, infrared, Photography. Bookmark the permalink.